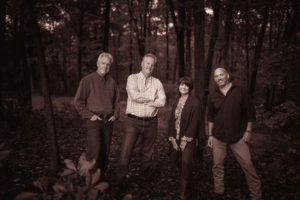 The Marlborough Arts Center’s 4th Friday @ the Arts Cafe presents the musicians of the well-known “Seat of Our Pants” (SOOP) on Friday, April 26, at 7:30 p.m. at 231 North Main Street, Marlborough, CT.
One of the most popular shows at the Arts Center, Marlborough’s own SOOP will be back for the 6th year in a row. Their songs are both heartfelt and humorous, their melodies are heavenly, and they play an array of instruments you don’t see together every day with Mike Frantzen on fiddle, Mark Hall on Cajon/cowbell/percussion, Jeff Gorman on bass, and Carolyn Brodginski on vocals and whichever stringed instruments she decides to bring along for the night. For this particular performance they will be joined on fiddle by J.D. Williams, who plays with Amy Gallatin’s band Stillwater’s and The Hot Flashes. SOOP is an acoustic folk/blues/bluegrass/country/old time/rock quartet who play in the live music scene throughout the state. In addition to favorites from their CDs, you will hear some brand new SOOP originals. Their tastes are quite varied and it is the variety of the music that creates the fun for them, and for their audiences. Their personalities bring humor into their performances so that an evening with them is very interactive and a delight for all ages. They are charming individuals who have become a dynamic group. Treat yourself to an evening of music that will leave you laughing, maybe crying too, and certainly thankful that you decided to spend some time with this talented and delightful crew. The Marlborough Arts Center is a non-profit regional center for the fine arts, performing arts, and fine crafts. These “4th Friday @ the Arts Cafe” evenings, held in the gracious Charles W. Hall Art Gallery, add music and a convivial atmosphere to the beautiful setting and are an opportunity for people in the communities around to relax together and enjoy art in its many forms. The concert begins at 7:30 p.m., but doors are open at 7:00, allowing a chance to see the art now on exhibit, choose a seat, and settle in for the music. Admission at the door is $ 10 per person. BYOWine. Other refreshments are available. Visit the website www.marlborougharts.org or telephone (860) 295-9389 for more details on the many artistic activities offered by the Marlborough Arts Center including renting this beautiful facility for an event of your own.